• Illustrated throughout with photographs which support the explanations of the therapeutic application. 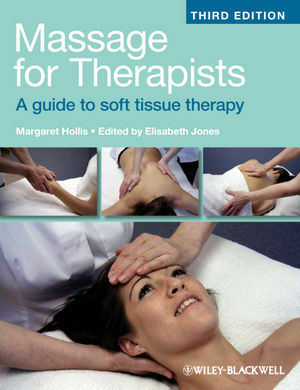 Elisabeth Jones is a chartered physiotherapist who has lectured and taught massage and aromatherapy worldwide, and run a training centre for massage, aromatherapy and reflexology for over 25 years. She has worked in the NHS, in nursing homes and in private practice, and currently runs her own private practice. Basic structure of the nervous system. The endocrine/hormonal system. (ductless glands). The effects of stress on the endocrine system. Nervous and chemical control.of respiration. I The basis for massage. Fluid balances of the skin. Definitions associated with muscle action. Physiological effects on the.circulatory system. Physiological effects on the nervous system. Physiological effects on the musculoskeletal system. Summary of the mechanisms of massage therapy. Massage in vulnerable groups – risk awareness and contraindications. II The application of massage. Clinical features that may guide the therapist towards the possible sources/causes of patients problems (the ‘genics’). Determining the indications for massage. Aspects of examination and assessment that relate to massage. Observation and palpation using massage strokes to identify indications. Observation and palpation using massage strokes to identify contraindications. Measuring change and outcome measures. Specific soft tissue mobilisations (SSTMs). Palpation and developing sensory awareness. Examination of the part . For a treatment in sitting position. For a treatment in lying position. Preparation of the treatment couch. Treatment of the lower limb with the patient supine. Treatment of the lower limb with the patient prone. Thumb kneading round the patella. Palmar kneading the anterior tibial muscles. Thumb kneading the anterior tibial muscles. Thumb kneading the peronea muscles. Thumb kneading the dorsum of the foot. Thumb kneading the sole of the foot. Thumb kneading the interosseous spaces. Thumb and finger kneading the toes. Skin rolling and skin wringing. The anterior tibial and peroneal muscles. Treatment of the patient in prone lying. Client in forward lean sitting. Exit foramina of the trigeminal nerve. Brisk lift stroking and shaking. Pre natal, labour and post natal. Hold relax (HR) (contract relax. Combining repeated contractions with soft tissue techniques. Thai massage (Thai yoga massage). Basic rules of sports massage. Massage manipulations in sports massage. Historical uses of essential oils. A working knowledge of essential oils. Methods of administering essential oils. Glossary of terms and properties of some essential oils. The practical application of essential oils. Effects and uses of aromatherapy massage. Support for staff and carers. Oils not to be used at all in therapy. Oils never to be used on the skin. Oils not to be used with patients who have epilepsy. Blending of oils and formulation. Basic principles and techniques of shiatsu. Physiological effects associated with shiatsu. Professional development of the therapist. Introduction to the fascial matrix. Aims of the MFR approach. Palpation philosophy and possible barriers to effectiveness. Exercises to enhance palpatory skills. Exercise 1: Attuning whole and bilateral hand sensitivity. Exercise 2: Enhancing palpatory sensitivity. Exercise 3: Palpating fascial glide. Exercise 4: Influence of palpation and body tension. Exercise 5: Palpation changes with different states of mind. Exercise 6: Identifi cation and documentation of fascial restrictions. Exercise 7: Identification of the dominant holding pattern in the body. Involving the mind and feelings. An exploration of suggested rationale and their clinical implications. Evidence of effectiveness in clinical practice. So what do we feel with our hands? Illustrated throughout with photographs which support the explanations of the therapeutic application.